Super easy homemade breadsticks made with just 3 ingredients and ready in only 15 minutes! Unroll pizza dough on the counter or on a cutting board. Slice dough into 8 strips. Take one strip and fold it over in half. Twist gently and place on baking sheet. Brush each breadstick with melted butter. Sprinkle salt over top, to taste. Bake breadsticks for about 9-12 minutes, or just until golden brown. Try using garlic salt instead of regular salt to make Garlic Breadsticks. Try sprinkling with grated Parmesan or garnishing with chopped chives or parsley. 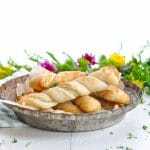 You can store leftover breadsticks in a sealed container for up to 1 week (or longer) or they can be frozen.